Winner or Dinner is a special coin-collecting minigame in Mario Party 8. It is the only 2-vs.-2 minigame that focuses on earning coins. A plain desert is revealed in the first shot. A twister then whirls through, and when it passes, an oasis is revealed. This is where the minigame takes place. The main idea of the game is to collect coins that pop out of the Warp Pipe in the oasis center. Spiny Eggs also pop out, and running into one will leave the player paralyzed for a moment. Around the edge of the oasis are four Piranha Plants, which are near most landing points of coins. If the player gets too close, the Piranha will chomp them and throw them out of the oasis. The next batch of items that pop out of the center pipe will include the players that were tossed out. 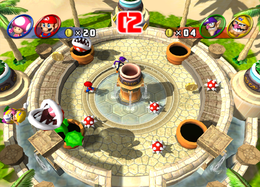 The players perform their victory dances in the oasis (unless they earned zero coins, in which case they form their losing poses) and the screen zooms out to the original angle. The twister then returns and the oasis disappears. Rules – "Bonus minigame! Grab the most coins in the oasis. Watch out for Piranha Plants!" Hint – "When the Piranha Plant throws you out of the oasis, get ready to launch into action. You'll pop up in the center!" This page was last edited on May 22, 2017, at 16:06.